Grease 6 jumbo muffin cups with shortening or spray with cooking spray. Cut or tear baked French loaf into 1/2-inch cubes; set aside. In medium bowl, beat eggs and sugar lightly with whisk. Beat in half-and-half. Divide bread cubes evenly among muffin cups. Divide chocolate chunks evenly into cups. 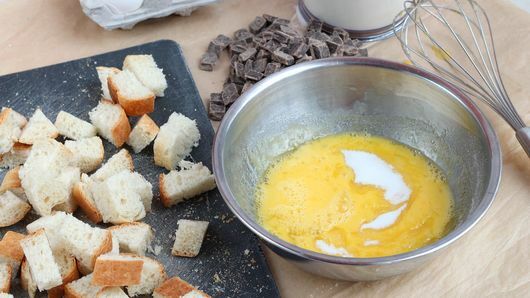 Carefully pour egg mixture over bread cubes. If it seems like the bread cubes are beginning to rise, press them down with your fingers. Cover muffin pan with plastic wrap; refrigerate at least 8 hours or overnight. In the morning, heat oven to 350°F. Remove plastic wrap from muffin pan. Bake 25 minutes. Cool in pan 5 minutes. 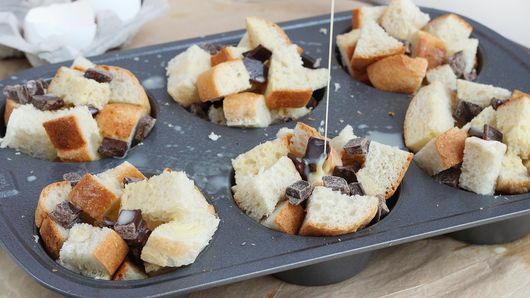 Remove French toast cups from muffin cups to plates. Serve with a drizzle of chocolate syrup. Although you can make French toast with fresh baked bread, it’s better if the bread is 1 to 2 days old. 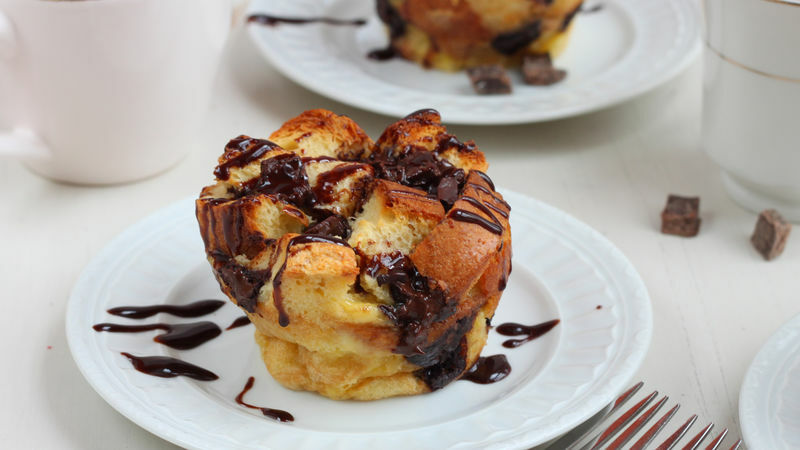 Enjoy the French toast cups the day they are baked, preferably while still warm.